Happy Saturday All and hoping everyone is enjoying the weekend. 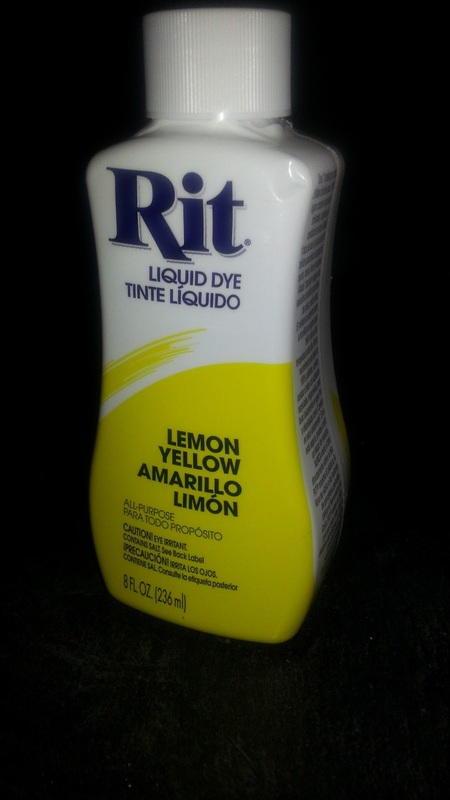 I spent the better part of the day sleeping and finally decided to get out of bed and put my foot to the pedal and quickly got my food shopping out of the way, quick stop at joanns, catching their Butterick sale and finally focusing on my weekend project.... color revitalization. Last weekend I finally moved out my winter wear to summer and in the process flagged garments that were fading from years of wear. So my main project this weekend involved dying old rtw garments that have seen better days, however still fit perfectly. 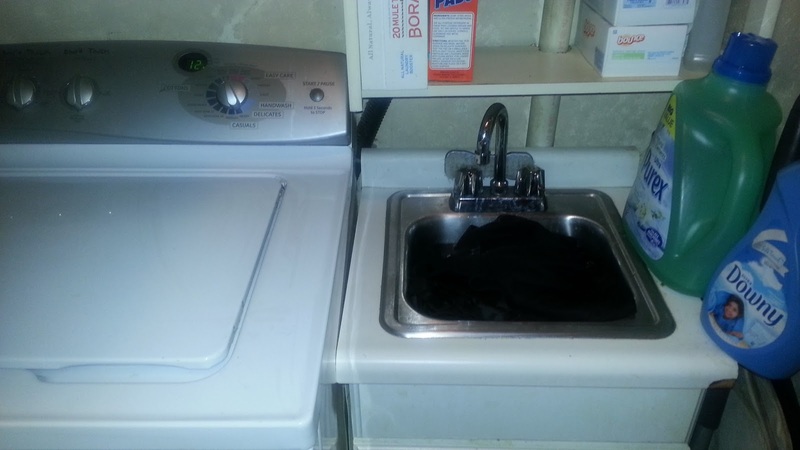 As the water boiled on the stove, I immersed the jacket in the laundry sink, ensuring that it was soaking wet. Then proceeded to mix the dye into the boiling water and thereafter the jacket followed, waited 5 minutes then added white vinegar. 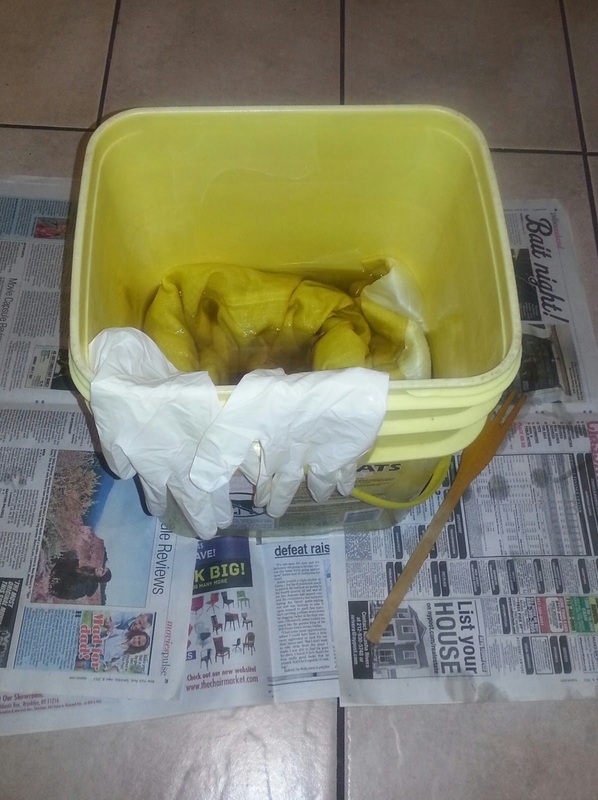 The white vinegar intensifies the color. 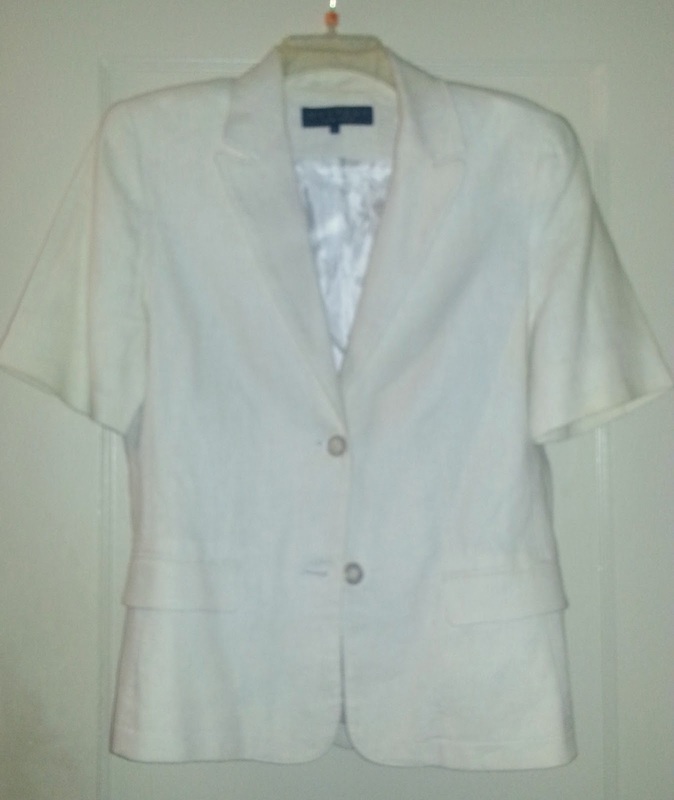 After 45 minutes, I removed the jacket and washed on a cold cycle. Removed the jacket from the machine and took a quick photo of the color in its wet stage..... it's now hanging for air drying. Once its fully dry, I will give it a hearty steam iron. 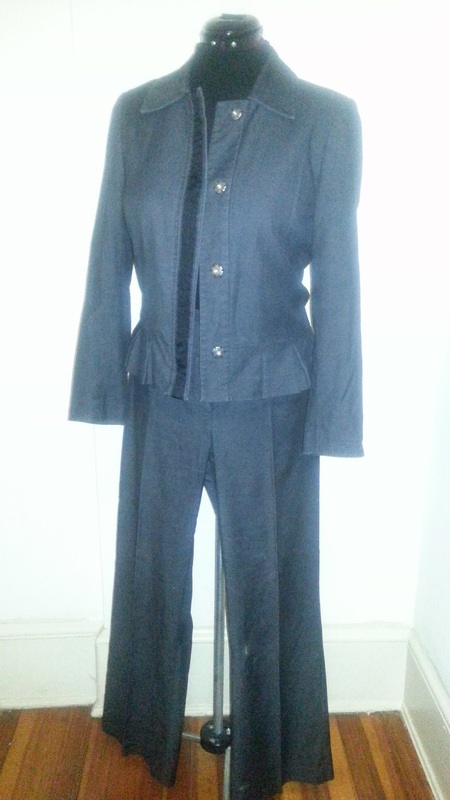 The next garment is another old one, a light-weight denim suit in a cotton/spandex blend that I love and the fit is perfect. However, it has faded over the years and in need of revitalization as well as shortening the sleeves. Repeated the process of boiling water while soaking the suit in preparation for dying. Since its two pieces I am letting the garments soak longer in the Denim Blue coloring. 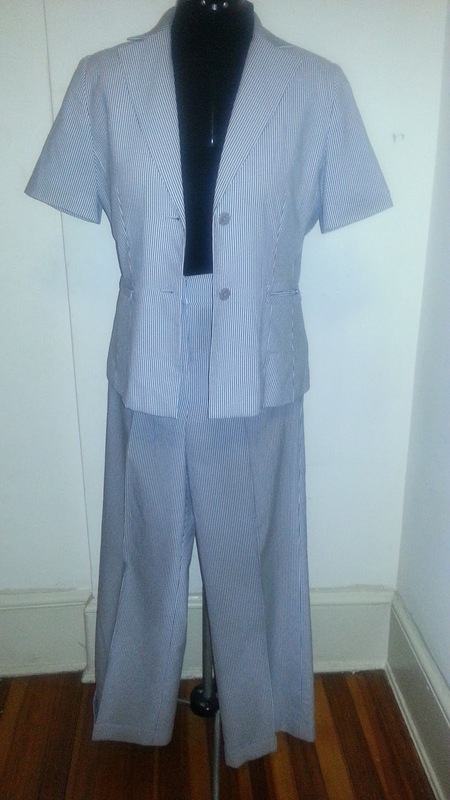 Here are two more garments that need color revitalization. 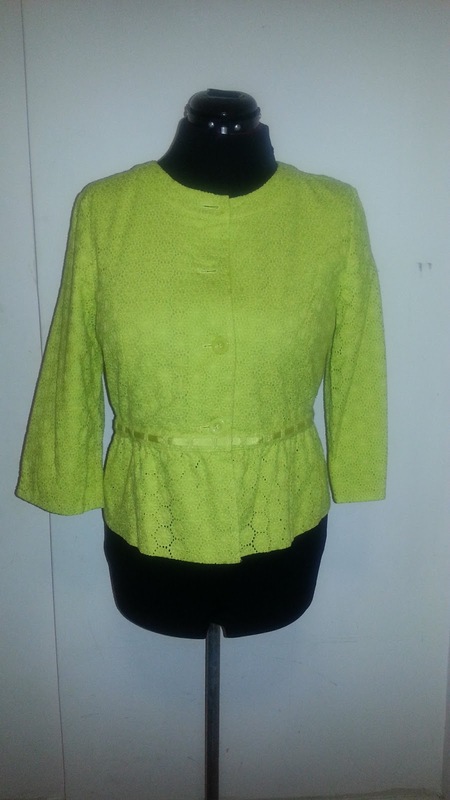 Purchased this cotton lace jacket 2 years ago for $19.99 from Chadwicks, but upon receiving it, was not happy with the neon green color. 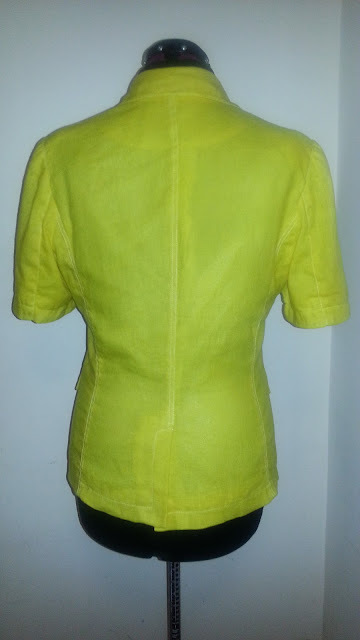 So the jacket needs a refashion... short sleeves and a deeper shade of green. What a brilliant idea to revitalize your well-loved pieces. Great job with dying the white jacket! I really look forward to seeing what happens with other items. 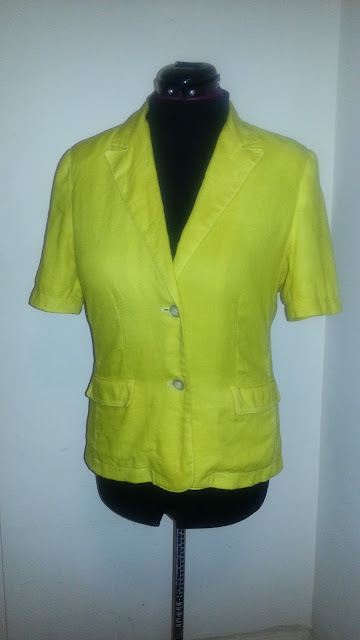 Thanks Irene, I am really pleased with the yellow jacket. The denim suit is currently drying. There wasn't a significant change, but it doesn't look as washed out like before. Thanks Linda. The next two garments (neon green jacket and seersucker suit) will be a challenge. I am not sure yet what color I want for the suit. You did a really good job in dying your garments. The colors really pop too. Thanks Sister. Old garments are the perfect guinea pig. Despite loving certain pieces, if they are not wear worthy, refashion is the next phase and if all fails... off to donation or trash heaven. Looking forward to your revitalized garment. Thanks Faye. 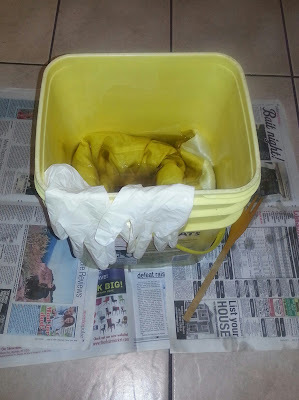 Not only is this a way to revitalize old pieces, it's also an intro into trying my hand at dying fabric. Threads' current issue (Thanks to Alethia) features a marbling technique, which I would like to try. 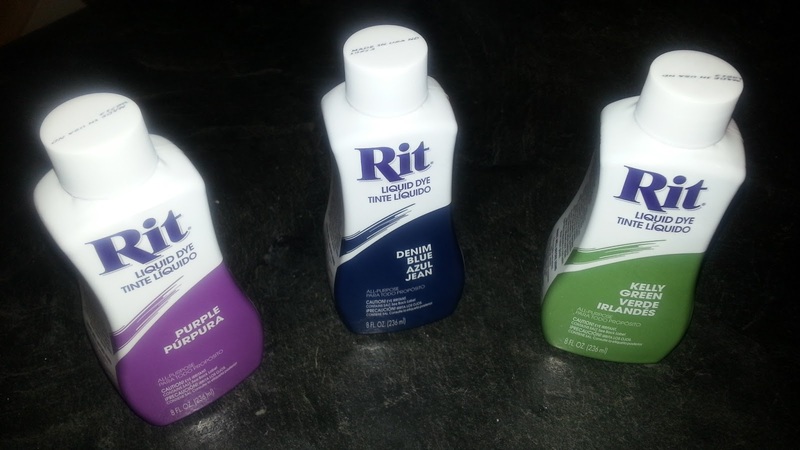 Thanks for the link to using RIT dyes. I have had limited success in my washing machine, and will now try your methods. The white jacket really came out well! Thanks Mary and looking forward to your dyed garment. You are so productive! Congrats on your new wardrobe are in order, eh? Donation heave. LOL. The yellow jacket looks as if it was purchased that way. Cost efficient way of increasing the wardrobe too. Sheila, the yellow dye came out fantastic. Love that you are refreshening and refashioning the garments!! You are much better than I at refashioning. I just give everything away. I've managed to size a few things down recently, but mostly just give things away.